Women's Original Tall Rain Boots is rated 3.8 out of 5 by 8. Lancée en 1956, la botte haute Original est fabriquée à la main à partir de 28 pièces et selon le modèle d'origine, pour un ajustement et un confort exceptionnels. Ce modèle emblématique est au cœur de la marque Hunter Original. Découvrez l'histoire de la botte haute Original [ici] (http://www.hunterboots.com/ca/fr_ca/discover/heritage-the-original-boot/). Rated 5 out of 5 by Ebony from Perfect fit These are very comfortable boots and the fit was perfect. Rated 3 out of 5 by Jenilee from to tall and tight in calf I'm 5'6 and these boots were about 1inch to tall. Hit the back of my knee if I bent my legs at all. Also snug in the calf. Measure before you buy. These boots are not ment for anyone with muscular or larger calfs. 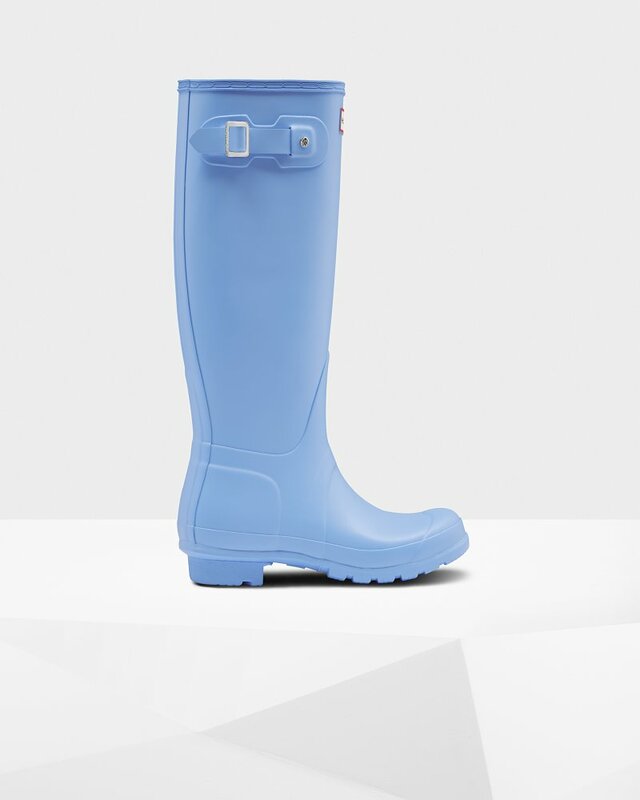 I returned and got the original play tall rain boots which I love. Rated 3 out of 5 by Aanne from Love the colour I love the colour but the shin circumference is very narrow. I had to return and get a bigger size and it is still too small. I am not sure what how to get a good fit in these boots because if I went any higher in the size, there would be too much space in the feet area. Rated 1 out of 5 by Mango from Tearing apart at seam I bought the tall black one 1 year ago, and around 6 months after they started to tear apart at the seem. Unfortunately I do not have my receipt, it is very disappointing, so I went to the store in Ottawa and they said their is nothing they can do about it. Rated 5 out of 5 by HunterGal from No regrets! I've had the boots for about 2 weeks now and live in Halifax, NS. Shipping took a while as I had purchased them during Cyber Monday. Love the boots and I find them perfect for the weather here. We have lots of rain, even during the "winter" season. I do tend to wear a thick sock when it hits around -5. When it gets colder, I add the Hunter Sock and its perfect to keep my feet warm. The only thing I will add here (since I have seen other reviews about it) is that I am 5'6" and the height of the boot just fits me perfectly, under the knee. If I would be an inch short, it would hit my knee and would not be comfortable. Rated 4 out of 5 by Pinknewf from Pink tall boots I got the bright pink boots but I really wanted yellow. I couldn't justify or afford the differnce. A little awkward to walk in as they dont bend when you walk. But I do like them. Rated 5 out of 5 by GG90210 from Super cute I ended up ordering a size bigger than my normal size (they are big). I still love them! Hunters are true to size, so I’d recommend you order your normal shoe size.